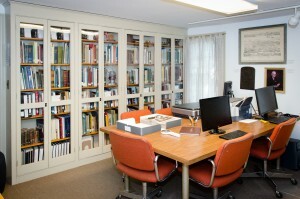 The Research Center is a repository of records focusing on Newtown history from its founding to the present time. The collection includes deeds, wills, diaries, genealogies, photographs, directories, inventories and maps dealing with Newtown people, land, houses, farms, schools, service organizations, events and many other topics of interest. The collections are strong in the period 1725 to 1813, when the village served as the county seat. Edward Hicks, America’s foremost primitive painter, is also well represented. The collections are of particular value to persons interested in genealogical information of former Newtown residents, and the maps and deeds are of assistance to those studying land history or dating historic houses in the Newtown area. In 2001, the archives were supplemented by a donation of over 150 photographs from the estate of Norman Kitchin. 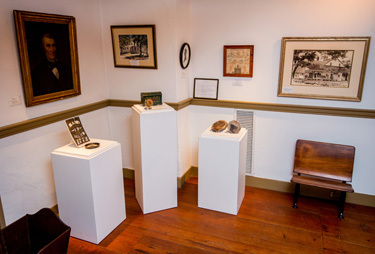 The Research Center was opened in 1982 and the core of the collection was a gift from Edward R. Barnsley, a long time Newtown resident, collector and preservationist. The Research Center & Barnsley Room of Newtown History is open to the public without charge on Tuesdays from 9:00 AM to 2:00 PM, Thursdays from 7:00 PM to 9:00 PM, and by appointment. Copying facilities are available. Research is also done by request. Download a copy of the Research Request Form.